Once again, it's not the season for these pictures, but we took these right before it got cold, and i just love them! The kids were soooo excited to go fishing with dad, and we all had a really good time. 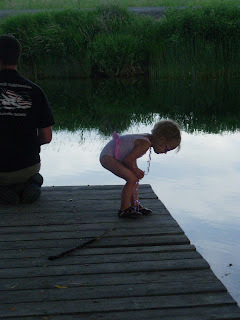 We did catch a fish, a big one too, but we put it on the dock to photo it, and it jumped back in the water. ( i promise, we did really catch one, that's watch the kids are looking for in the photo!) This pond is a neat little private pond out by our house. 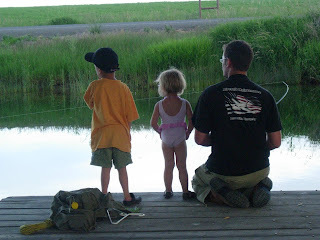 it's so convenient to take the kids there in the evenings to let them watch the fish. I am actually the only one in the family who will eat fish, so we always do the catch and release thing, nice for the fish i guess! We had a lot of fun this last summer getting use to our new little town, and now we're all ready for this summer, with plenty to keep us busy. It's been quite an adaption comeing to Moses Lake, but it has it's hidden beauties, you just have to look a little farther. Sounds like you live in a wonderful place. What brought you to Washington? I was so glad to read your Blog and see that your oldest son is doing well. I should have kept better contact. So what are you doing now a days? Are you working or are you able to stay at home with the kids? Do you keep in contact with anyone from school? I used to make it to Utah every 6 weeks and Rachael would do my hair but I haven't been to Utah since September. She used to fill me in on all the gossip! :) I will for sure keep in touch now that we have made contact again. The kids look like they are having a great time. I can't wait till Kylee is big enough for that stuff! Love you! I just have to say again that the picture with Brandon and the kids fishing is one of those timeless, calendar-quality pictures that everyone sees and says "Aaawwe!" You guys are so cute!